My daughter, Phoebe, has finally hit that stage where she’s starting to be a little more open-minded to exotic flavors and will at least taste dishes that are unfamiliar to her. (As long as they don’t have eggs or fish… the girl knows her limits.) 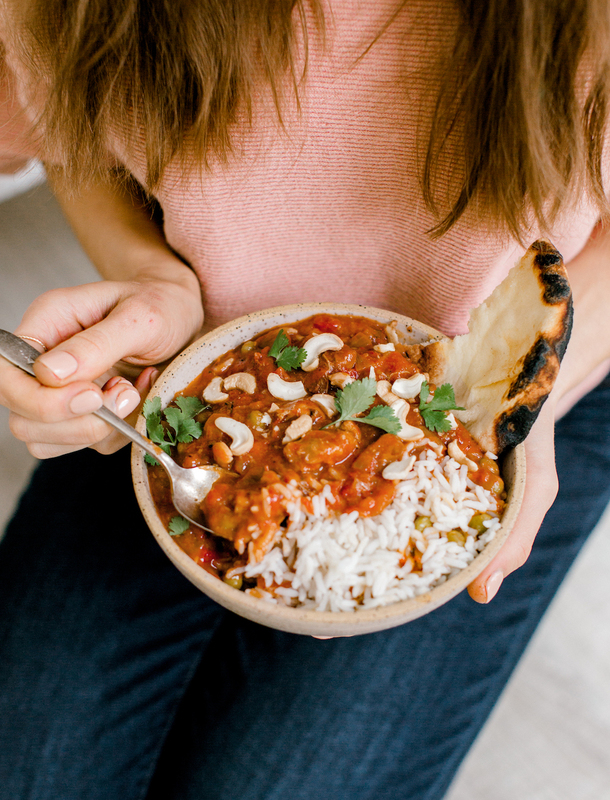 As a result we’ve been on a major Indian takeout kick since both our kids will actually gobble down bowls of chicken tikka masala, rice, and naan bread — just writing those words literally makes me do a happy dance inside! 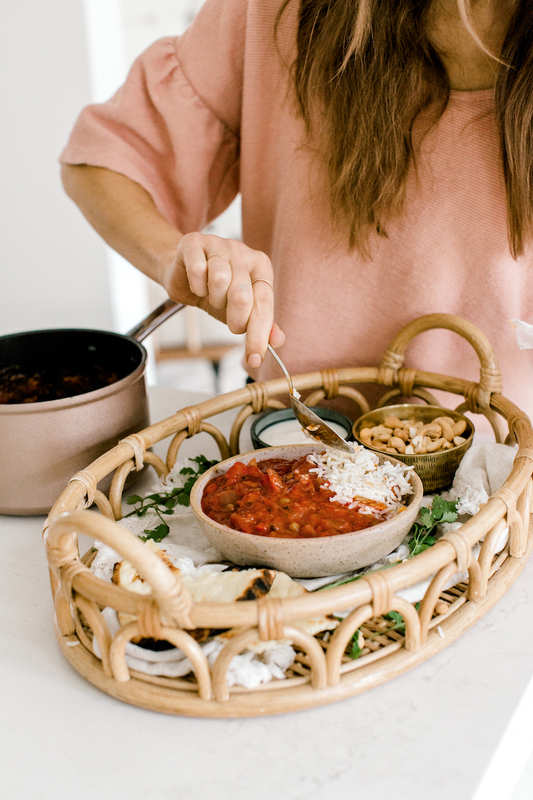 Since there are only so many nights I can order takeout without feeling gross, I made it my mission to create a healthy homemade chicken tikka masala recipe that’s easy enough to make on a weeknight. And since it’s one of those saucy meals of chicken and veggies that gets better the longer it marinates, I guessed that it would be a perfect candidate for the slow-cooker. BINGO. Is anyone else turned off by slow-cooker recipes that require you to sauté ingredients in a pan first? I mean, the main reason I’m using my crockpot in the first place is so that I only have one pan to wash at the end of it. 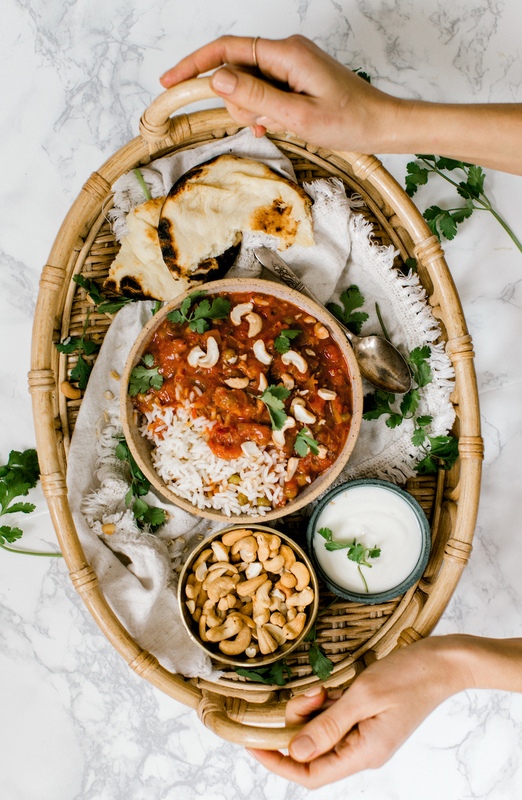 So it goes without saying that one of my favorite things about this recipe is that you chop up a few ingredients, throw them in the slow-cooker before work, and when you get home you’re greeted by the most mouthwatering aromas of your favorite Indian meal. But with less grease, sodium, and after-bloat. You’re welcome. For those who are wondering, our favorite Austin spot for Indian takeout is Tarka Indian Kitchen – seriously so good, and I’ll frequently order the grilled chicken kebab with sautéed vegetables when I’m keeping things healthier. Scroll on for the recipe, and let me know if y’all give this a try. Add all the ingredients to a slow-cooker and cook for 8 hours on low, or 4 hours on high. Chicken should be super tender and fully cooked through. Divide into bowls and add garnishes. Serve with rice or cauliflower rice if desired, and eat! This is amazing! I cannot wait to make this weekend! This looks delicious. I wonder if it can be made with chunks of chicken breast and light coconut milk? I will be giving it a try. Absolutely – I think it would work wonderfully. Let us know if you give it a try! This recipe is a keeper! Made it with roasted veggies and naan. Sooo good! Hello! What size can of coconut milk do you recommend? I’m in Hong Kong and there are several choices in my market! Can’t wait to make this! 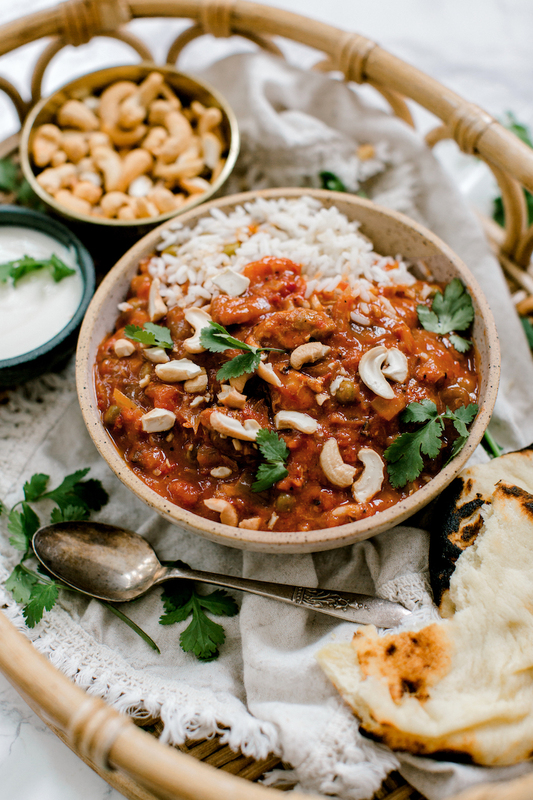 I love Tikka Masala, but I’ve never made it myself. Will definitely try this recipe. Ouuuu!! I like chicken curry in general so it would be nice to try it fresh and it’s very easy! Thank you, ? ?